Whether you're a prince on a hand-built Trek Madone 6 or a Pauper on a Huffy—stat tracking is the best way to improve your riding fitness. These two upcoming Garmin products will record what you need, regardless of your budget. For the cash-strapped biker, the $150 Edge 200 GPS-enabled cycling computer tracks the essential stats—time, distance, speed, location and calories burned—without needing to install a separate sensor. It also stores 130 hours of previous stats and can upload them to Garmin Connect—the company's free data analysis and mapping website. 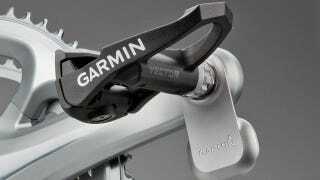 The Garmin Vector, on the other hand, replaces the stock pedal body and spindle and measures the force profile of a pedal stroke as well as total power and cadence—it even differentiates between right and left leg power. Connect it to either the Garmin Edge 500 or 800 to calculate Normalized Power, Intensity Factor and Training Stress Score data (and a bunch of other stats most people outside the Tour de France have never heard of). The price for this information does not come cheap, however. You'll be paying a trading your kingdom for this $1,500 horse when the Vector comes out next March—plus the cost of an Edge ($250-450) if you don't already own one.